It’s not uncommon for certain cuisines to proliferate in a particular urban neighbourhood, or for that matter, on a single street, and London is home to a number of examples of this phenomenon. Brick Lane comes to mind—a popular eating destination in East London well known for its abundance of curry houses, among other retailers and eateries. “Pho Mile,” located on Hackney’s Kingsland Road, is perhaps a little lesser known, but is revered for its remarkable choice of reliable and authentic Vietnamese food. Among the stretch of over ten Vietnamese restaurants on the street are Sông Quê Café, with queues out the door right as they open at noon, and Việt Hoa, which was first established as a canteen to provide affordable meals to Vietnamese immigrants. Many of these establishments continue to be family-run businesses with loyal customer bases. Settlement in Britain was difficult for many Vietnamese immigrants who fled the communist regime after the 1975 fall of Saigon. Among the community, these immigrants were referred to as “boat people,” because many had to escape by sea in overcrowded and small boats, which were frequently attacked. When these immigrants finally arrived in the UK, the British government did not allow them to settle in one area, creating a sense of isolation. 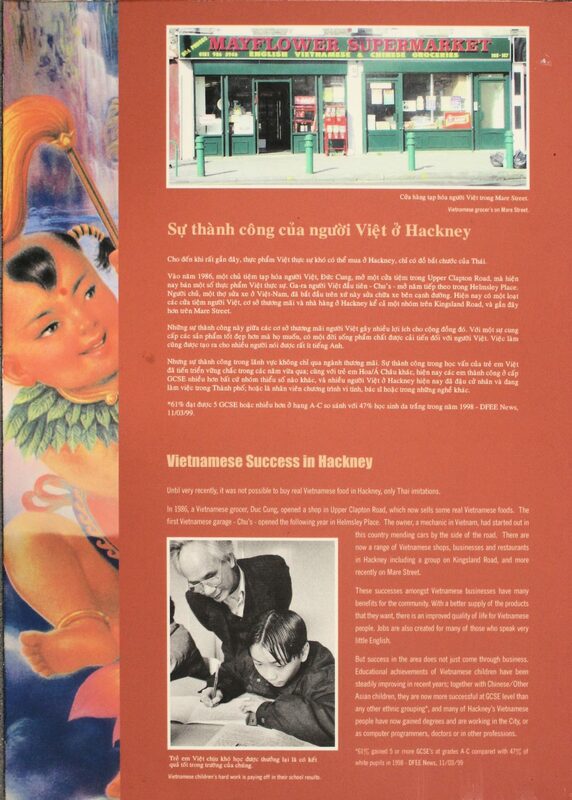 According to Hackney Council, the exact number of Vietnamese people in Hackney currently is unknown, but local community centres put estimates at around 5,000. Centre 151, an independent charity that promotes community integration for the Vietnamese, Lao and Cambodian communities in Hackney, estimates that 32,000 Vietnamese people are now living in Britain. Before their arrival to the UK, many in the community were forced to stay in refugee camps where they were unable to receive a formal education or social services, leading to many in this generation taking up work in hospitality. “The majority of adults concentrate in the area of service provision. Their contribution to Hackney’s dynamism is undeniable with some areas such as Mare Street and Kingsland Road peppered with Vietnamese businesses,” Centre 151 explains. Today, these businesses are certainly aplenty; exit Hoxton station and one is greeted by an array of restaurants, many with small and unassuming storefronts, offering a range of dishes from classic pho to barbecue plates. Phochimama, a relative newcomer, having opened in April of last year, serves up traditional Vietnamese food and barbecue dishes in an inviting space with a contemporary, minimalist décor. “We try to stick to more traditional Vietnamese food, because a lot of the other restaurants have Chinese dishes,” Brandan Leong of Phochimama tells Something Curated. Vietnamese cuisine encompasses many diverse dishes and ingredients, but rice is the staple of most meals. Rice is also made into rice paper, which is used to make rolls, or cha gio. In addition to rice, noodles serve as the base of many meals and are an important ingredient for pho and hu tieu, two versions of Vietnamese soup.Pho is the pride of many restaurants on the street, and perhaps the country’s most well known meal. The popular soup dish is made from spices and beef stock accompanied by noodles and thinly sliced beef or chicken. David Nguyen, who recently began working at the family business Mien Tay, says that their traditional pho with flat rice noodles is a customer favourite. Mien Tay is named after the area in Southern Vietnam where the family behind the establishment is from. According to the founders, “The Mekong Delta runs through the region sustaining an abundance of fish and vegetation and our cooking reflects these fresh and fragrant characteristics typical of Vietnamese cuisine.” Some of these dishes are fresh rolls with prawn, crispy squid, and goat with galangal and chargrilled quail. Because fishing is a main source of food in both England and in Vietnam, seafood continues to be characteristic of the Vietnamese settler’s diet. As the Hackney Museum’s exhibition detailed, fish and fish sauce are popular and can be seen in a variety of dishes. David Nguyen feels that attitudes toward Vietnamese food have changed over the years largely due to customers’ tastes shifting to prefer sweet meals to spicier ones. The flavour of these meals depend largely on what region the dish originates from—southern Vietnamese cuisine is often sweeter, while northern cuisine tends not to be too bold in any one particular taste. Typically, Vietnamese food is relatively economical, making it more accessible than other types of cuisines. On the reception of the cuisine in London, Brandan Leong says: “I would say it appeals to more, not necessarily lower class people, but I want to say teenagers and young people, who don’t want to spend too much money.” “We see our customers wanting authentic, traditional and fresh Vietnamese food more than ever,” says Abbey Danks of Viet Grill, which specialises in grill dishes cooked over burning charcoal on their fire burning josper oven. Viet Grill is part of the Vietnamese Kitchen, a group of three Vietnamese restaurants in East London, including Cây Tre and Kêu. As recently as a decade ago, there were only about four or five of these Vietnamese restaurants on Kingsland Road. Tay Do Café, Tay Do Restaurant’s café counterpart, was founded in August of 2000 and prides itself on being one of the “originals” in the area. The restaurant takes its name from a city in South Vietnam, now known as Can Tho, and serves dishes where the food is meant to be wrapped in rice paper, since the city is known as the village of rice paper making.